I’ve been reading more slowly the last month or so, so consider this a catch-up post. First, my crime fiction pick of the month of the past two months is Don’t Look Back by Karin Fossum. It seems like a promising start to the Inspector Sejer series: an interesting protagonist and a story with enough twists in a small town. Secondly, I’m making good headway in the Global Reading Challenge having read 3 out of 7 books. Finding authors from South America and Africa was a little time-consuming because I abandoned quite a few books I tried. I am grateful for a great statewide interlibrary loan system: I’ve been able to get lots of international crime fiction from Michigan State University’s library that’s hard to find elsewhere. My progress on the USA Fiction Challenge, on the other hand, is pitiful, and I plan on reading more from the US in the second half of the year. Finally, I was a giver for World Book Night this past week for the first time. I gave away copies of Katherine Paterson’s Bridge to Terabithia around town on a sunny day, and I capitalized on my location between the junior high school and elementary school in town. The only difficulty I ran into was people declining the book because they’ve already seen the movie. Hope your reading is going well, and I hope to catch up on my blog reading soon. February was a busy reading month for me, and I’m finding myself reading a lot more books than I have time to review as well as gravitating to non-crime novels. Life is getting busier, and I’m trying to give myself a bit of a break and not review absolutely everything I read. I’ll still post a few reviews a month, but they may be a bit more sporadic. 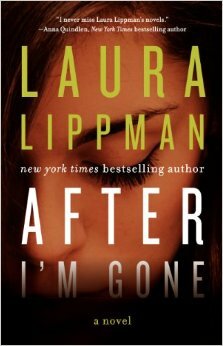 This month my pick is Laura Lippman’s After I’m Gone, which is the story of the wife and daughters left behind by a mobster who fled the country (presumably) before sentencing. And my favorite read of the month that I didn’t get a chance to review is Arnaldur Indriðason’s Silence of the Grave. It’s a very affecting novel, and it’s one of my favorite reads of the entire year. I hope you have a good reading month in March. My long-range goals are to read books from or set in lots of different countries, and I managed four different countries this month. I also plan on reading more pre-1990 crime novels, for a little variety, and this month I dug into some Patricia Highsmith with mixed feelings. Finally, I’m planning on reading more books by women this year because last year slightly less than half the books I reviewed were by women. So far my ratio is 100% women, which is a great start. But statistics and personal reading goals aside, I consider January a good reading month because I discovered the great Dominque Manotti, whose Lorraine Connection was a surprising, well-told, and brutal story that started with an industrial accident at a television factory in France and became much more ominous. While I think the other books I read in January were decent, I was very impressed by Manotti. 1. Bad Blood by Arne Dahl- The second installment in the Intercrime series did not live up to Misterioso for me. Some serial killer stories don’t work for me. 2. The Land of Dreams by Vidar Sundstøl,- A moody book about the murder of a Norwegian on vacation on the North Shore of Lake Superior and the history of the area. It’s the first book in Sundstøl’s Minnesota Trilogy. 3. The Maid’s Version by Daniel Woodrell- This is a beautifully written story about a fire caused by an explosion at a dance hall in a small town in Missouri during the Great Depression. 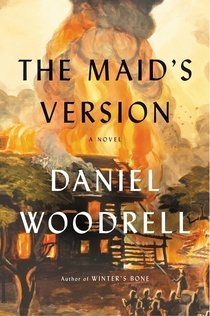 My favorite book by far is The Maid’s Version by Daniel Woodrell. Please check out Kerrie’s collection of Crime Fiction Picks of the Month at Mysteries in Paradise. I feel a bit silly having a pick-of-the-month when I reviewed only three books on the blog in July, but my favorite of the month is one of my favorite reads of the entire year. 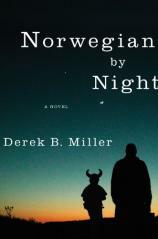 Norwegian by Night by Derek B. Miller- It’s striking that the most alive, vivid character I’ve read all year is a very old American suffering from dementia. This is the book I’ll be giving as a gift to lots of family and friends. The Man Who Went Up in Smoke by Maj Sjöwall and Per Wahlöö- This is a brisk entry in Martin Beck series that moves the action to Hungary. A Very Profitable War by Didier Daeninckx- A PI novel set in Paris after World War I with a surprising ending. I hope to read more in the coming month, and I hope that the great book purge of 2013 that I completed last month will help: now that I’ve cleaned out the books I’m not interested in, the good ones are more obvious. No more double-stacked shelves! It’s halfway through the year, and I’m happy with what I’ve read this month and this half of the year. I’m grateful to the bloggers I read for steering me to such interesting picks. 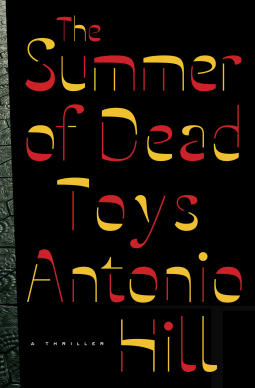 Three of this month’s books were very good (Hill, Vargas and Holt), and my favorite is The Summer of Dead Toys by Antonio Hill. Blessed Are Those Who Thirst by Anne Holt– This is a very strong entry in the Hanne Wilhelmsen series: a short novel about a string of violent crimes during a hot summer. Total Chaos by Jean-Claude Izzo– The first book in the Marseille Trilogy paints a very bleak picture of life and crime in that city. The Stranger by Camilla Läckberg– I’m new to this series, and I was struck by how much Läckberg focused on the characters’ personal lives at the expense of the crime. Inspector Imanishi Investigates by Seichō Matsumoto– Very good novel written over 50 years ago showcasing a hopeless case with a quite interesting ending. The Redeemer by Jo Nesbø– I loved this entry in the Harry Hole series. Summer Death by Mons Kallentoft– And I ended my month’s reviews with another book about a string of crimes during a hot summer. I’m interested in checking out the other books in the series because I like the main character, Malin Fors. This month, I’m happily surprised at the quality of the books I read. Three of the six books I read were very, very good, and my favorite is (unsurprisingly) The Redeemer by Jo Nesbø. Please check out Kerrie’s blog for a compilation of other bloggers’ crime fiction picks of the month. It’s finally spring here in the upper Midwest after a somewhat snowy (!) April. The driving force in my reading last month was geographical: I chose books to cover a variety of countries to meet the 2013 Global Reading Challenge, where my goal is to read three books from each continent. For Antarctica I’m substituting novels set in more than one country. I’ve finished over half of the books for that challenge, so I hope to move on to some personal reading challenges as well in the next few months: I’d like to read some classic crime novels and dig deeper into some series that I started since I started blogging. And maybe, just maybe I’ll read something American in the next few months too! 1. Pale Horses by Jassy Mackenzie- fourth in the Jade de Jong PI series set in South Africa. I felt like I had a lot of catching up to do with Jade’s personal life in this installment, and I’m willing to try the first book in the series, Random Violence to see if I like this book more once I have that background. 2. Misterioso by Arne Dahl- first book in the Intercrime series featuring the A-Unit. I liked the focus on the whole investigative team instead of on just one detective. This book had a great plot and great characters. 3. Food of Ghosts by Marianne Wheelaghan- first in a series featuring Scottish police officer Louisa Townsend who is stationed in the island nation of Kiribati. I liked the background about life on the island a bit more than the actual mystery. 4. Deadly Harvest by Michael Stanley- fourth in the Detective Kubu series set in Botswana. This is written by a duo from South Africa, one of whom lives in Minnesota now. The investigation centers on muti killings, which is a grim subject. Please visit Mysteries in Paradise for a collection of other crime fiction books of the month. My pick of the month is Blind Goddess by Anne Holt, and it’s because I’m interested in the characters. Visit Mysteries in Paradise for a collection of Crime Fiction Picks of the Month. A Cold and Lonely Place by Sara J. Henry- Second in a series about freelance journalist Troy Chance in upstate New York. Okay read. The Devil’s Star by Jo Nesbø- Not my favorite Nesbo, but I’m a fan of the series overall. Guilt by Jonathan Kellerman- I’m a longtime reader of this series, and this was a good but not great addition. 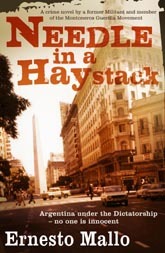 Needle in a Haystack by Ernesto Mallo- It’s about Argentina under the military junta, where the police are asked not to investigate murders committed by the military. The Crossing Places by Elly Griffiths- Ruth Galloway is my favorite character I read about this month. My favorite book by far this month is Needle in a Haystack, and I’m looking forward to reading the next book in the series, Sweet Money. Please visit Mysteries in Paradise for a collection of Crime Fiction Picks of the Month.